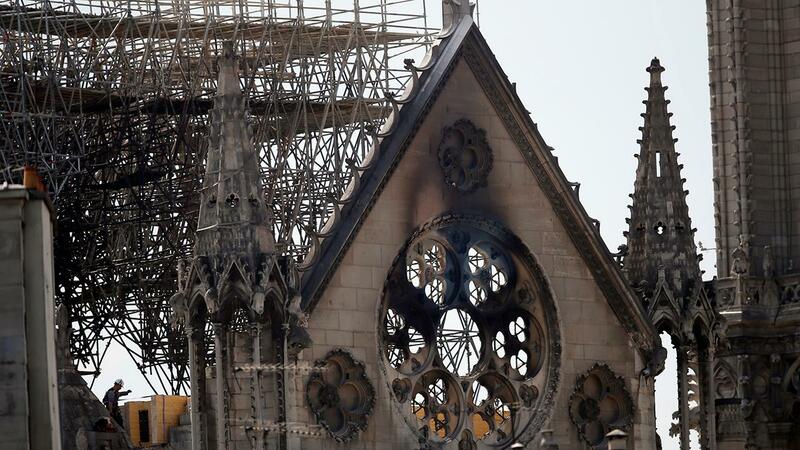 Some users on social media say they can see the outline of Jesus in the flames from the Notre Dame fire Monday evening. As Christians around the world observe Holy Week and focus their attention on Christ, one mother from Scotland said she could "see Jesus" in the fire that engulfed the Notre Dame Cathedral Monday evening in a post on social media. In the comments, she revealed she saw Jesus, along with other social media users. "When I looked at this photo last night, I was really astounded by what I saw," Rowan told Scotland&apos;s Daily Record. "When I look at it I see a silhouette of Jesus. I really see a vivid image." Louise Blair commented: "Looks like a figure of Jesus, or am I tripping?" Dom Disanto added: "I can see it pretty clear, gown and all." Rowan said she hopes it will "bring comfort to people in Paris and all over the world at this sad time." The Notre Dame Cathedral caught on fire a little after closing time Monday evening, one day after Palm Sunday during Holy Week. The Catholic church burned for over 13 hours as onlookers posted videos and photos of the fire and smoke billowing from the Gothic cathedral. Dramatic footage showed Notre Dame&apos;s spire collapsing, but many relics were saved and no one was harmed during the catastrophic blaze. French President Emmanuel Macron has vowed to rebuild what was destroyed within the next five years.